SAN DIEGO (KGTV) - An Otay Mesa father and dog owner says he did a double-take after he says surveillance video revealed who was hurting his dog. Wherever Pupa the poodle mix goes, little Alfonso Jr., 3, and Regina, 1, usually follow. Their father, Alfonso Galindo, calls the 7-year-old rescue a beloved member of the family, which is why his recent discovery was so tough to swallow. It all started when the strange stains that have been appearing for months appeared again last week in the patio of his home on Agosto Street. He checked his recently installed cameras and couldn't believe what he saw. "I'm at a loss for words," said Galindo. Just after 11 a.m. last Tuesday, surveillance video shows a postal carrier walking up to Galindo's mailbox and past the metal front gate. Behind the gate is Pupa, and as the mail carrier places the mail in the mailbox, a cylindrical object is seen in his left hand. At the same time, from another camera, Pupa is seen behind the gate beginning to convulse for several minutes. "The dog is withering in pain ... makes me sick to my stomach," said Galindo. Galindo said he searched through his videos -- about a month's worth --- and found nine similar incidents where his dog convulses after the postal carrier walks by. 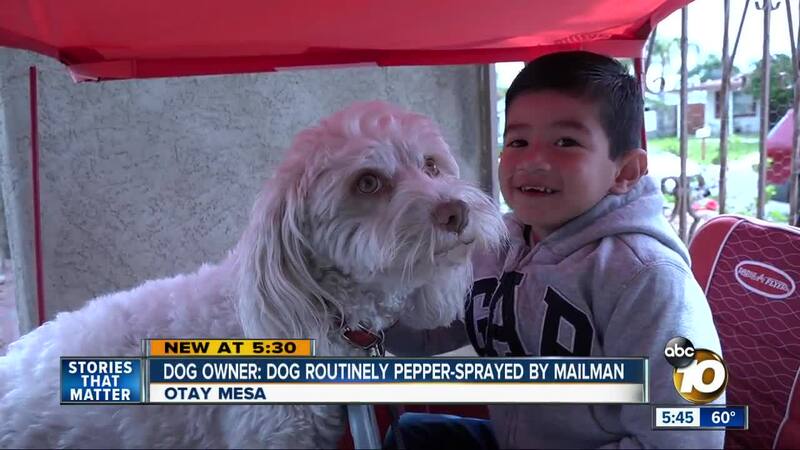 Galindo believes the mail carrier was casually and quickly spraying the pepper spray at Pupa's face. "It's a total betrayal of the trust. You would think the Postal Service is somebody you can trust," said Galindo. Galindo went through the last few months in his mind. Pupa did sometimes turn up with red eyes, but it would always go away. But was someone else in the home hurt? In the last six months, both of Galindo's children -- who are constantly touching and hugging Pupa -- have developed mysterious respiratory problems. "Countless trips to the ER and urgent care, and countless medications," said Galindo. "I get livid thinking about it. This is the health of my children," said Galindo. On behalf of the United States Postal Service, we want to apologize to the Galindo family and Pupa. We do not condone our employees behaving in a manner which is not professional and courteous. The appropriate personnel and corrective action will be taken as well as training given to all local letter carriers. Anyone who thinks their pet may have been pepper sprayed in that same area is asked to call San Diego Police at 619-531-2000.